Italian recipes can be very simple and cheap to make, you only need the best quality ingredients and little time to prepare them. 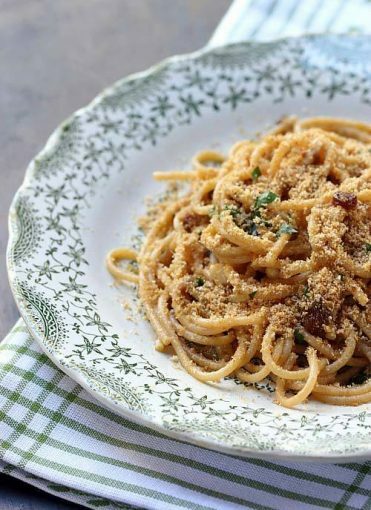 We are going to propose to you a series of lesser known, regional Italian recipes that you will love and we will start with this very popular southern pasta recipe prepared both in Sicily and Calabria. 2. Prepare the sauce in a pan with 3 tablespoons of extra virgin olive oil. Pour the garlic into it and leave to season for a couple of minutes. Combine the chopped pepper and the anchovies, mix them with a wooden spoon and after a couple of minutes turn off the heat. 3. Toast the breadcrumbs in a tablespoon of oil in a non-stick pan until golden. This ‘Cucina Povera’ recipe, dating back to the Middle Age, is a small masterpiece of essentiality made with “poor” ingredients that mix together to give it fantastic flavours and aromas. To prepare this tasty Italian recipe would take you no more than 15 minutes and would cost less then 2 pounds per person. The perfect wine for this dish is a mineral dry white like Vermentino or Falanghina.